Aeration and oxygenation (introduction of oxygen as air or liquid oxygen) are applied to stabilize or recover a disturbed oxygen regime in lakes. These methods are suitable as an expeditious measure against acute oxygen depletion or as an interim solution until external meas ures are effective. They may also be used to improve conditions for coldwater fish and other fauna in the hypo limnion. Additionally, the enrichment of dissolved iron, manganese, ammonium, hydrogen sulfide, and free car bonic acid in the hypolimnetic water is prevented and internal P loading may be reduced. Scientific background. Oxygen depletion occurs when the equilibrium between oxygen production and oxygen demand for decomposition of organic matter is disturbed. At low oxygen concentrations, oxygen consuming organisms are endangered and the anaerobic decomposition of organic matter leads to the formation and accumulation of toxic metabolism products (e.g., hydrogen sulfide, ammonium, nitrite) and other reduced substances (Fe2+ and Mn2+) in the water. The improved oxygen supply accelerates the decomposition of organic matter and therefore prevents an accumulation oforganic rich sediments. Due to the oxidation of sulfides, sulfur bound trace metals can be dissolved. Increased oxygen availability increases the P sorption capa city of oxidized iron, especially in iron rich sediments. Techniques. Numerous technical possibilities for aera tion/oxygenation have been developed during the last decades. 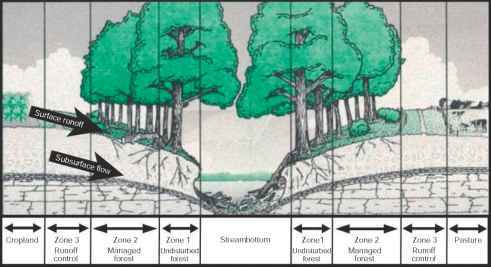 In deep stratified lakes, aeration of deep water is possible with or without destroying the thermal strati fication. The most common technique is a deep water aerator (Figure 7) placed at the deepest point of the lake with oxygen supplied from a storage tank containing liquid oxygen on the shore. The oxygen is carefully introduced by injectors or diffusers to avoid disturbing the stratification. Deep water may also be brought to the surface via a full lift reactor where it is aerated and returned to the bottom. Hypolimnetic oxygenation dur ing the summer can be supplemented with complete mixing in autumn by introducing compressed air. Additionally, deep water aeration can also be realized in a plant outside the lake, where the process can be com bined with external P elimination. Hydropneumatic pumps, turbines, rollers, or fountains are mainly used to aerate the water of shallow lakes. Aeration may also be combined with the addition of iron salt (see section titled 'P inactivation') to facilitate P precipitation and P reten tion in the sediment. Without the addition of iron, the effects on the P balance in the lake are restricted to the period immediately after the onset of aeration.